The Fasig-Tipton November Sale kicks off today in Lexington, Ky., and the Paulick Report is once again pleased to offer a print publication available here and on the sales grounds. 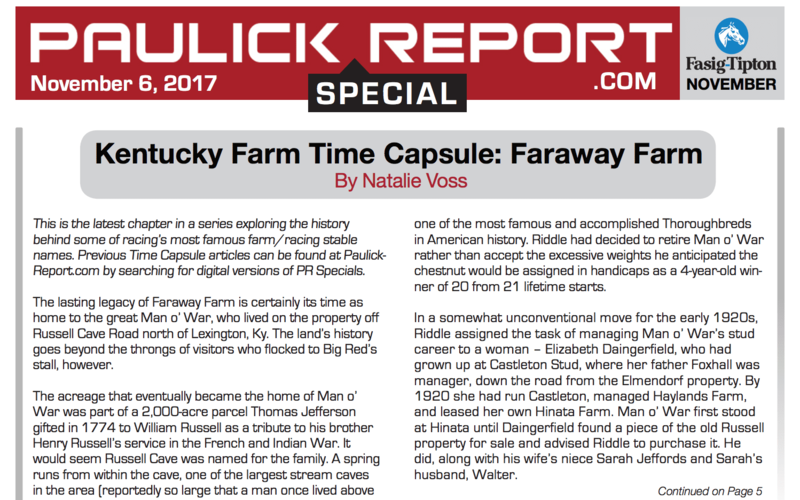 In this edition of the PR Special, Natalie Voss takes us back in time to the days of Faraway Farm, home to the legendary Man o'War. In the Stallion Spotlight, Frank Mitchell looks at the first foals from Triple Crown winner American Pharoah, and Mitchell points us to a handful of November hip numbers in Five To Watch. The Honor Roll highlights Fasig-Tipton November sales graduate and graded stakes winner Goodyearforroses. Dr. Jeff Cook answers a question regarding breeding soundness exams Ask Your Veterinarian. Click here to read that and more in this Fasig-Tipton November edition of the PR Special. This entry was posted in PR Special, Ray's Paddock and tagged american pharoah, breeding soundness exams, faraway farm, Fasig-Tipton November, goodyearforroses, PR special, thoroughbred sales by Paulick Report Staff. Bookmark the permalink.